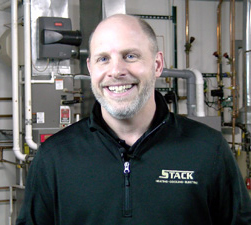 “Stack Heating & Cooling was founded in 1976 in our family home in Lakewood, Ohio, by my father and mother, Andy and Sandy Stack. After having been called in by other heating contractors in the late 80’s for his expertise in steam and water heating systems, Dad decided to focus his business on his specialty: making steam and hot water systems run at their best efficiency. In 1998, the business outgrew our offices in Lakewood and opened a new office on Lear Industrial Parkway in Avon. Since then, my brothers, sister and I have all added to the team with our own individual skills and strengths, returning Stack Heating & Cooling to a full-service heating and cooling company. Adding even more expertise to our team, all of our technicians are considered part of the family, and we strongly value their knowledge and commitment to our vision. Recognizing that not all contractors in the area are addressing air flow and home comfort issues, we expanded our location to include a hands-on training room with the latest equipment to make sure all of our technicians are experienced, knowledgeable and confident with all heating and cooling systems. We want to make sure your system is running as efficiently as possible and that your family is comfortable throughout the year regardless of what Ohio’s weather brings us. We’re proud that our customers consider Stack Heating & Cooling the go-to specialist for home comfort in the Cleveland area, and we will continue to be a friendly and familiar face to our Cleveland community. We thank you all by standing by our products and service and providing the best possible customer experience for you. Superb service above my expectations. I will strongly recommend Stack Heating to my friends and colleagues! I’ve told everybody I’ve talked to I am very happy with you & they should consider you when they need a furnace or air conditioning. Great service, products & personnel! We love Stack, they have always been helpful, honest, prompt and knowledgeable. We have recommended them to a number of our friends, and no they don’t pay me to brag about them, I do it for free!!! I can always count on your company to provide prompt, high quality service. The technician that came out to my house was probably the best repair person who ever came out to fix anything in my home. He was very professional, courteous, and extremely knowledgeable. I just wanted to say after years – I MEAN YEARS – of so-called experts coming out to fix my boiler from various companies, Stack was the first company to get it right! Everyone was great! A good experience.